Settled in the earlier part of the 14th Century, the Pueblo of Nambe is one of New Mexico’s 19 Pueblo tribes, and one of six Tewa-speaking Pueblos. Historically, Nambe was known for its strong agriculture, textiles, and pottery production. Nestled in the foothills of the the Sangre de Cristo Mountains, 20 miles north of Santa Fe, the Pueblo is almost completely surrounded by non-Indian towns (mostly Hispanic) and is home to approximately 400 members. Since Spanish contact in the mid 1600’s, Nambe like other Pueblos has been heavily influenced by the introduction of Catholicism and Hispanic traditions which have, over time, caused great change in the social and cultural organization of the Pueblo. 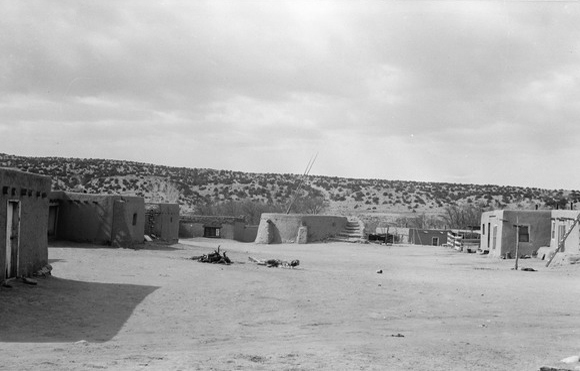 However, even while the original Spanish Mission church dedicated to Saint Francis de Assisi fell to ruin, ceremonial structures were maintained by the community and remained a significant architectural and spiritual element to not only the people of Nambe, but to other Tewa Pueblos who still consider Nambe an important and central religious site. During a good part of the last century to present-day, Nambe has remained steadfast in its commitment to revitalize its indigenous religious practices and to reestablish the sacred center of the Pueblo. 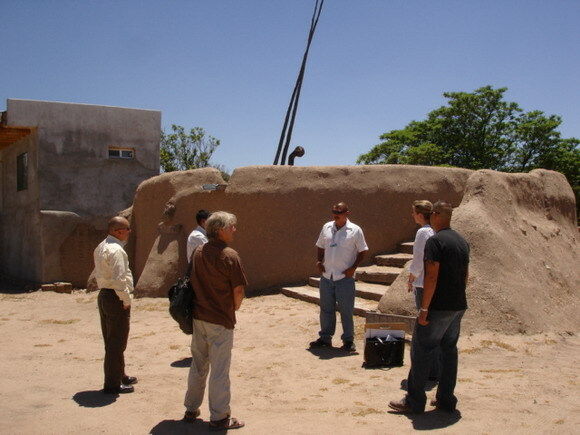 Included in this process is the need to rehabilitate the round ceremonial Kiva and other associated structures that are integral components to the practice of the Pueblo’s culture/religion. In 2011, with a grant from the Chamiza Foundation of Santa Fe, the tribal leadership organized a project focused on doing just that, including carefully documenting all work associated with any restoration. On invitation by the traditional leadership of the Pueblo, Barbara Felix Architecture + Design (BFA+D) became engaged with the Pueblo’s initiative to document and stabilize the adobe ceremonial Kiva, located at the Southeast corner of the village Plaza. Following a review of a preliminary assessment report produced by Santa Fe-based Cornerstones Community Partnerships as well as architectural documentation gathered during the Historic American Buildings Survey (HABS) of 1934, BFA+D conducted additional historical research as well as a thorough assessment of the physical structure. BFA+D presented its Recommendations Report to Governor Phillip A. Perez, members of the Tribal Council and representatives of the Traditional Leadership in March of this year. The report, which describes existing conditions, offers recommendations, estimated costs and a proposed schedule for implementation which will be used by the Pueblo to develop a community-based project and fundraising campaign. Included is the repair of the earthen-plastered adobe walls, and the removal and reinstallation of a new earthen roof system. While the report was in development last fall, we provided preliminary recommendations to improve the drainage on the earthen roof system in preparation for the approaching winter season. Thanks to strong community involvement, the immediate roof repairs were implemented under the direction of the traditional leaders and our Earthen Architecture Preservationist. It has been an honor and a privilege to work with the tribal community during the assessment phase of a much longer-term preservation initiative. As the Pueblo moves forward with fundraising and organization of a more comprehensive preservation project, BFA+D will continue to provide technical guidance and support as required. We join the Pueblo in its vision to preserve and rehabilitate the cultural and sacred environment of Nambe for future generations. For more information about this unique project and ways you can contribute financially, please contact Brian Vallo, Marketing and Tribal Projects Coordinator at vallo@bjfelix.com.